Last Thursday evening, with the sun setting and the air slightly chilled, I stood on the corner of 22nd Street and 8th Ave with a group of people all waiting to tour the two residential Chelsea blocks that had been turned into an outdoor exhibition by curator Lal Bahcecioglu. 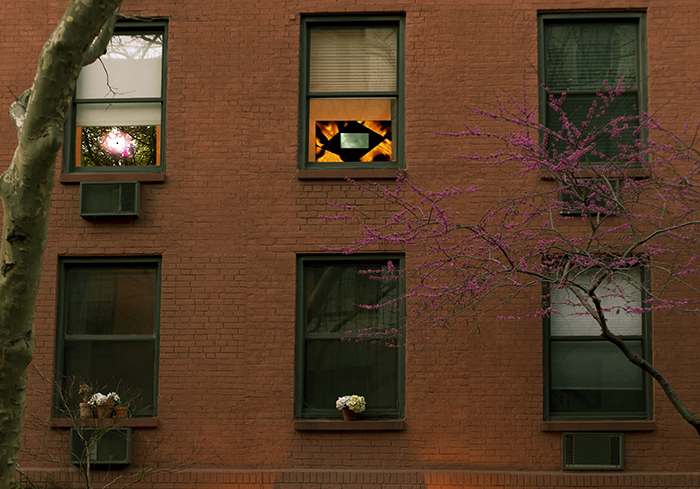 With her show entitled Sneak a Peek, Bahcecioglu turns four residential buildings and one commercial storefront into exhibition spaces by installing video monitors in the street-facing windows. The result takes the viewer out of the gallery space and on a short stroll along a quiet residential street, peppered with video installations. All of the participating artists in the show are a part of either, the International Studio and Curatorial Program, or Residency Unlimited, both of which bring international artists to New York for residencies. Bahcecioglu told me that part of the reason she chose to work with foreign artists for this project is because “when one is in a foreign city for a limited time, one sees the city differently.” This relates back to the overall mission of the show, which is to get people—the “curious passersby and art audiences alike”—to relate to art within an altered context. On the night of the opening, before Bahcecioglu lead the tour down the two 22nd Street residential blocks, I took a moment to walk through the exhibition myself. When taken out of the group tour setting, there is something discomforting, yet oddly freeing about being given the liberty to stare through people’s windows without judgment. Some windows had thick blackout curtains covering everything but the monitors, while others left their apartments in plain view adding a new level of voyeurism to the works on display. In this setting, I became much more aware of what I was able to see through the windows that were not intentionally on display as part of the exhibition. TV’s glowed through curtain-less windows; lights illuminated kitchens and living rooms with residents milling around, going about their private evenings that now happened to be on view. As I stood on each block, exhibition map in hand, I felt that I had been let in on a secret of sorts, invited inside from the outside. Installing video work in residential spaces to be viewed from the sidewalk does, of course come with its fair share of obstacles. Works such as Not Worth It (Sara Eliassen & Lilja Ingolfedottir), which re-interprets the visual language of advertising into somewhat perverse sentiments, and The Time of Leaves (Kanako Hayashi), which deals with the aftermath of the devastating 2011 East Japan earthquake, are both obstructed by window bars, hindering the viewing experience. While a more abstracted work like Subliminal (Graciela Cassel) is installed in a clear open window, it is difficult to see all the way up on the third story of the building. But, there is a reason that the white-box perfection has become the norm for museums and blue chip galleries alike: because it’s a way to control context, which is a difficult thing to do out in the world. With only six works on display, one of which is on view in a commercial space, the intentionality gets a bit lost. 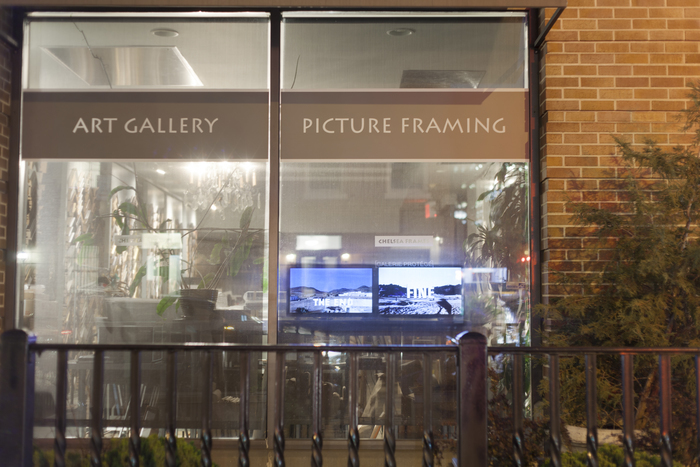 For instance, The End is Fine, by artist duo Ghost of a Dream, which distorts the ending sequences of classic films, is on display almost ironically in the Chelsea Frames storefront window, under decals that read “Art Gallery” and “Picture Framing.” At first glance, the videos look as if Chelsea Frames had installed them to be just another advertising display. But understanding the more complex context of the work as questioning the perceived filmic reality versus our own lived reality, it becomes evident that it is a smart curatorial choice to place this video within the context of a contrived space like a storefront, especially one that is labeled “Art Gallery.” But with no wall text, or press release to hand out to every passerby, the viewer is not always “in on it,” so to speak. The curatorial conceit is an interesting one: turning the private windows that are already inherently on display, into actual public exhibition spaces. But it’s an installation decision that runs the risk of both overshadowing the actual artworks, as well as being lost on many unintentional viewers. Bahcecilogu intends to keep exploring this idea however, with research already underway to bring the format of the semi-open air exhibition to the residential windows of select Northern European cities, and to her hometown of Istanbul, Turkey, all of which could unlock new and exciting possibilities for this novel format of viewing art outside of the gallery context. Sneak a Peek, a semi-open-air exhibition, runs along West 22nd Street, between 8th and 10th Avenues, New York City, from April 14–24, Thursday–Sunday, 6–9pm.